Wonderla Bangalore - One of the best amusement parks in Bangalore that is located on the Bangalore - Mysore highway. If you are thinking for a vacation out to Bangalore then you should have wonderLa as a must visit place in your list. WonderLa is the Leading amusement park located in Bidadi, Bangalore. WonderLa has a wide variety of rides, water rides, laser show, dance show with on and off rain shower, virtual reality shows etc. WonderLa Bangalore is the best place for the kids and youth to have fun. This place will make your holiday a memorable one. 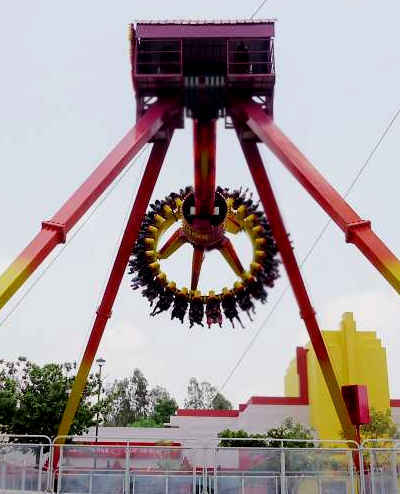 Wonderla Bangalore has Recoil, India's first reverse looping roller coaster at 80 kmph. The amusement park also features many locker rooms, First aid rooms and very clean restrooms. It also has five restaurants and conference hall facility. The amusement park also has a resort with a nice room facility, children play area. If you are going to stay in the resort then you are eligible for free breakfast , lunch and WonderLa admission ticket at free of cost or in discounted price(verify the latest info with management). There are water recycle plant in wonderla which recycles the water and keeps it purely for the use of visitors. Wonderla is well known for its thrilling ride and fun water rides. The most thrilling rides are Hang Glider which takes you to an adventures trip to the very big height. The pirate ship is also a thrilling ride and not advised for weak hearted people. The sky wheel is the largest giant wheel which gives you the view of the entire amusement park. Crazy wagon is another ride designed like a horse wagon which swings. Crazy car, toon tango, techno jump are the other rides that make your heart beat stop for a while. There are many other rides for you to enjoy. You should be really cautious before going to the rides like flash tower, Insanity, Hurricane, wonder la bamba, and mixer as these are high thriller rides and they are not suitable for weak hearted people. The water rides in wonder La will never let you come out of it, It makes the adult also behave like little kids. Some of the water rides which is really great are Jungle lagoon which is designed on a jungle theme, boomerang, water pendulum. You can have a lot of fun playing in the wave pool, forgetting the time. However the wave pool is opened only for a particular time slots because it is closed for frequent cleaning purposes session after session. Uphill racers, twisters and fun racers are the other water rides which are of utmost thrill. The best part of wonder La is the Rain disco. Like to dance in the showers of rain? Then Rain disco is the best opportunity for you. You can have a great party time getting wet in the rain shower and dancing along. Just the words can’t describe the joy it gives you. The musical fountain and the laser show is a true treat to eyes. The cinemagic 3D is a virtual reality show which gives you a great 3D experience. There are several kids rides like merry go, frog jump, moon walker, Train express, funky monkey and carousel. The joy and the smile which the kids carry while riding of these rides will take you to another level of happiness. There is an option called fast track ticket that allows you not to stand in queue for any ride. Please check about this option in the ticket counter whether it is available. Beware of your belongings and have your child always under your supervision. Do not leave anything unattended. Do not have heavy meals while going for the rides as it may make you puke. Stop when you are tired or feel any discomfort. Wear a comfortable dress which does not disturb you play or cause any injury. Avoid wearing saree or dupatta which may be uncomfortable for you to enjoy the rides. Go early to the park so that you can enjoy the most. Many people feel that one day is not enough for Wonderla Bangalore. The amusement park is open all the days. It operates from 11:00 AM to 6:00PM Monday to Friday, 11:00AM to 7:00PM on Saturday, Sunday and other holidays. Note - Child rate is based on height, ranging between 90 - 140 cm. So what are you waiting for? Plan your next trip to wonder la soon and have unstoppable fun.